Preheat oven to 400°. Place oven-proof skillet over medium-high heat; drizzle in oil. Sear tenderloins on all sides until brown. Place skillet in oven; roast until internal temperature reaches 145-150°, about 12-15 minutes. Remove from oven and let rest for 5 minutes. 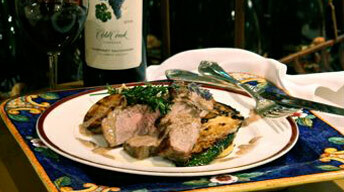 Slice tenderloin and serve with CSM Cabernet pan sauce and grilled vegetables or roasted potatoes.